UPDATED: Wed., Aug. 15, 2018, 10:12 p.m. Sometimes it takes just one pitch. 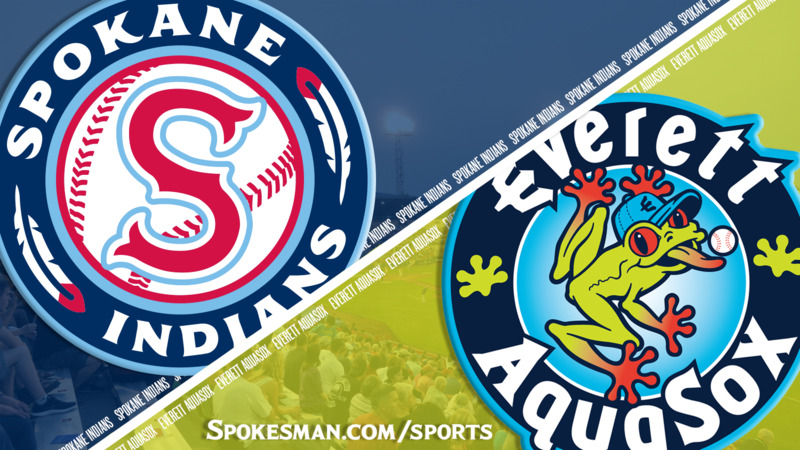 Ryne Ogren launched a full-count fastball into the screen above the left-field wall in the eighth inning and the Everett AquaSox edged the Spokane Indians 4-3 in the second of a three-game Northwest League series at Avista Stadium on Wednesday. Despite the loss, Indians starter Seth Nordlin remains confident in his team. Nordlin led the league in strikeouts entering play with 61 in 50 2/3 innings. The righty added five strikeouts to his total and allowed three runs on seven hits and a walk over five innings and left the game tied at 3. Nordlin ran into trouble right from the jump. With one down in the first, Josh Stowers lashed a single to right and with Hasuan Viera holding the runner, Bobby Honeyman bounced one through the hole in the right side to put runners at the corners. Cal Raleigh followed with a double off the wall in right to plate Stowers, and Nick Rodriguez’ groundout brought in another run. Everett (10-10) added to the lead in the third. Ryan Ramiz drew a walk and Honeyman singled on the ground to move him to third. Raleigh lined a single to right and Ramiz plated the third run. The Indians picked up a run in the bottom of the inning. With one down, J.P. Martinez walked and stole second. With two down, Curtis Terry flared one off the end of his bat into short left and Ramiz’s diving attempt was in vain. Martinez, running on the play, scored without a throw and Terry ended up with an RBI double. Three straight singles – by Jax Biggers, Starling Joseph and Tanner Gardner – to lead off the fourth made it 3-2. Cristian Inoa grounded into a double play and Joseph scored to tie it. It stayed that way until the eighth. With two down in the frame, sidearm reliever Pettibone got too much of the plate on the payoff pitch and Ogren’s sky-high fly went for his third homer of the season. In the bottom half, Hasuan Viera reached on a drag bunt, went to second on a wild pitch and took third on the overthrow. Terry then walked to put runners at the corners. Diosbel Arias struck out – after taking an inside strike two that looked a lot like ball four to Terry – and Biggers rolled over to first to end the threat. The Indians went in order in the ninth. Published: Aug. 15, 2018, 9:28 p.m. Updated: Aug. 15, 2018, 10:12 p.m.